Other pages in my Ukraine series. 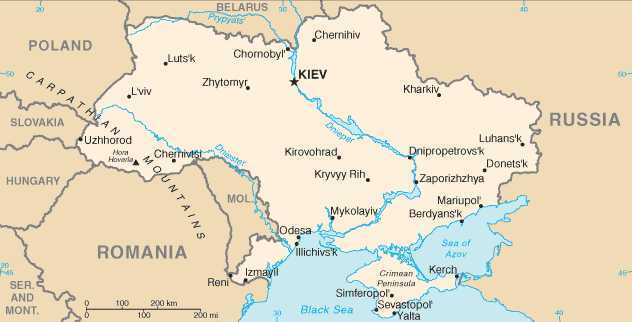 It borders Russia to the north-east, Belarus to the north, Poland, Slovakia and Hungary to the west, Romania and Moldova to the south-west, and the Black Sea and Sea of Azov to the south. The historic city of Kiev (Kyiv) is the country's capital. From at least the ninth century, the territory of present-day Ukraine was a centre of medieval East Slavic civilization forming the state of Kievan Rus, and for the following several centuries the territory was divided between a number of regional powers. After a brief period of independence (1917–1921) following the Russian Revolution of 1917, Ukraine became one of the founding Soviet Republics in 1922. The Ukrainian Soviet Socialist Republic's territory was enlarged westward after the Second World War, and again in 1954 with the Crimea transfer. In 1945 Ukrainian SSR became one of the co-founder members of the United Nations. It became independent again after the Soviet Union's collapse in 1991. This information was correct in December 2003. E. & O.E. In 2006, while visiting and spending a couple of months in Hungary, attending the 50th Anniversary of the 1956 Hungarian Revolution - (Freedom fight), Hui Chin and I took time out to visit Ukraine. We spent some time visiting Yalta, the Swalow's Nest, Simferopol and the Capital, Kiev. Before our departure we read a few guides etc and most of them advised to take US $ and € as the only acceptable currency, well none of the hotels or shops would accept either, only their local currency. As for our stay, we thoroughly enjoyed our stay and found the local people very friendly, patient and helpful. I will return to some of the most outstanding instances at my other pages.